Subsea 7 have commenced works at the Port of Hasting’s Crib Point Jetty. The site is currently being set up with site sheds and a barge has arrived to undertake works to accommodate the Cooper Sole pipe spooling project. The Port of Hastings requires that parties undertaking works at the Port receive the relevant regulatory approvals prior to works proceeding. In this case, the project has received approval under the Coastal Management Act for the installation of berthing dolphins and pipe rollers. This Project last occurred at the Port in 2009. 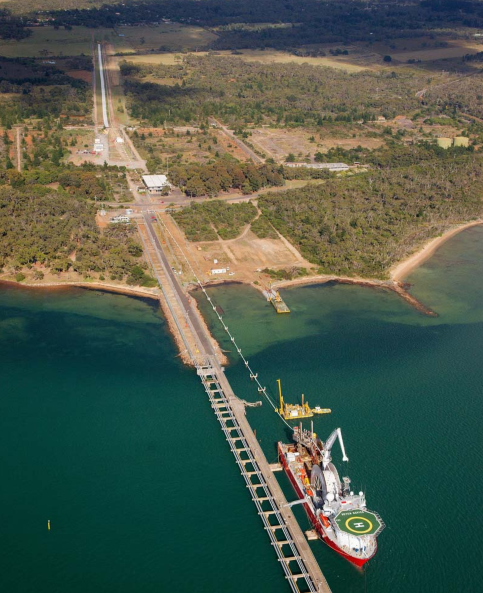 The Project will involve spooling 64km of 12” pipeline for installation offshore in the Gippsland Basin as part of the Sole Development Project. Spooling operations are scheduled to commence in September and can be viewed by the public from the Wooleys Beach reserve. Residents can expect to see increased activity at the Crib Point Jetty site from now until the end of the year. Today AGL and the Port of Hastings Development Authority (the Port) entered into an agreement that will soon see the Port commence work remediating Crib Point Berth No.2 (the Berth). Port of Hastings CEO Malcolm Geier is looking forward to working with AGL as work on the project approvals and feasibility studies continue. Sealite's new Atlantic 3000 ocean buoy is the first large ocean buoy in its class to offer a 3 metre diameter float section without the incorporation of a central steel mooring post. This innovative modular design ensures the buoy is fast, safe plus easy to assemble and deploy. 10/08/2017 - The Port of Hastings Development Authority welcomes the announcement by AGL that the Port's jetty located at Crib Point in Western Port is the preferred location for AGL's gas import jetty. This project will help secure the states gas supply needs and bring competition to the domestic market.